Preparation of book of urban indicators for publication by ADB. 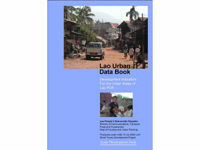 Identification of urban indicators, definition of urban areas, collection of data from central and provincial sources throughout Lao PDR. Preparation of environmental planning guidelines for use in government and private sector. Proposals for revised procedures and development of detailed guidelines. Drafting of detailed planning system and building codes, and guidelines for their implementation.